Restaurant chef Laura Goodman has resigned after boasting about spiking a vegan group’s meals on Facebook. After spending hours preparing a special menu for a party of vegan and vegetarian guests at her Italian restaurant, the chef lost her temper when one of them dared to ordered a Margherita pizza (which has mozzarella on it). 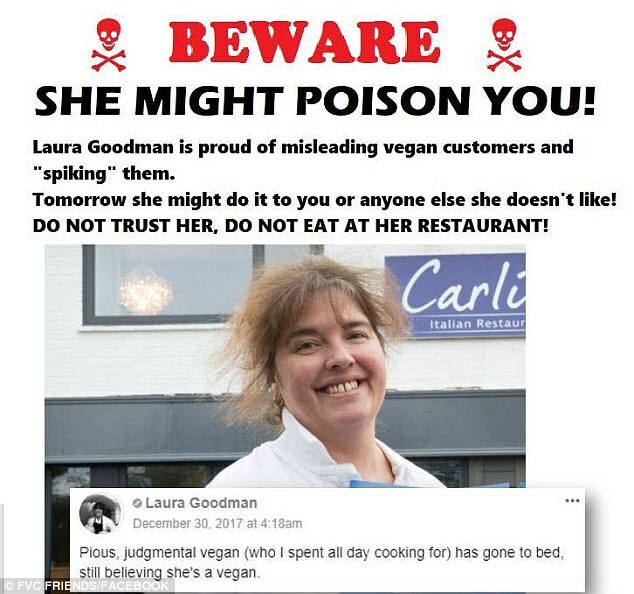 Once the evening was over, Goodman, who co-owns the Carlini Italian in Shifnal, Shropshire, had a bit too much to drink and hopped onto social media to tell on herself (although she now claims her comments- see below- were only made flippantly and should not have been taken seriously). She has now apologized and police are investigating death threats made against her. Since her little outburst, a protest has been scheduled and her TripAdvisor and Google scores have gone down from five stars to one. What do you guys think? While it’s true that she should NOT have made those comments should people be reacting the way they are? Would you? Daily Mail, January 3, 2018.